“Winter Nose” (or sometimes Snow Nose) is a term used to describe the color change on a dogs nose. His mom Robin calls him – her #doodometer. I can determine the temperature outside by looking at his big doomometer nose. When its chilly, his doomometer is kinda purplish and when it’s warm my doodometer is black as coal. Legitimate hypotheses – just not feasible for a dog at the tender age of four! 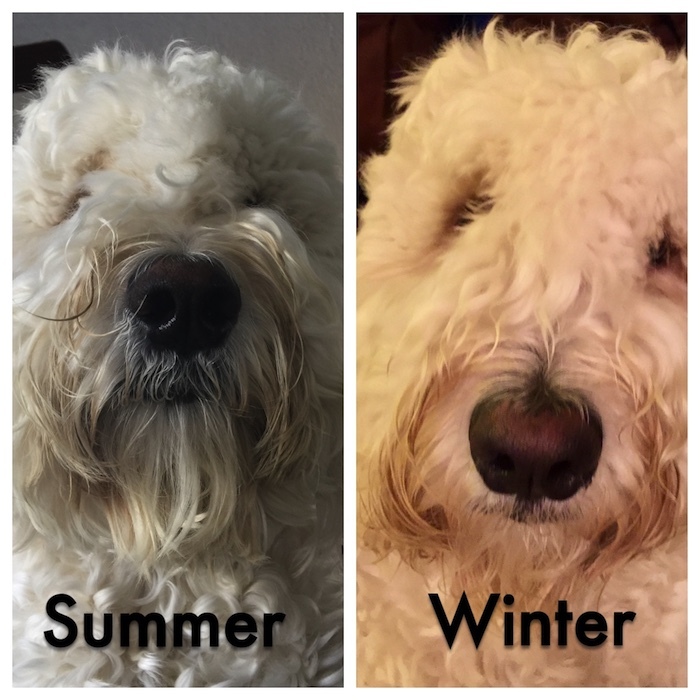 Snow nose, winter nose (also called “hypopigmentation”) results from loss of sunlight, and causes the nose to fade to brown in winter; normal colour returns as summer approaches. Snow nose occurs mainly in light-coated breeds; the colour change can become permanent in older dogs. It is not associated with disease. Some breeds are more prone to the change in nose color due to weather. While Winter Nose / Snow Nose is usually harmless, sometimes it can be an indication that medical attention may be needed. Please contact your vet if you don’t know WHY your dog’s nose has lost it’s pigment. New Monday – New Week – New Goals! Harley’s not old, just a little chilly. Thanks for the lesson. I’ll pass it along. I have never watched D and L’s noses.. now I have to! How adorable. Hey — if you can, send a little prayer Dash’s way. We have managed, with medication, Dash’s hypothyroidism really well… until now. Doc is concerned with weight gain, slow heart rate and an ear infection. We go for a re-test on 12/29. Prayers that we can adjust the medication and my doodle-boy will be A-Ok. Thanks! Sending POTP for Dash! Callie had been on thyroxine for several years, and we had it under control. Hopefully all Dash needs is a slight adjustment to his meds. Shadow has had a liver-colored nose since she was about a year old. Callie’s nose was coal black her entire life, even during the winter months, so I guess she had melanin to spare. Katie’s nose turned more and more pink as she aged, but it didn’t change for seasons. Bailie and I have black noses no matter what. It is interesting to think about what causes the change in some dogs. Oh wow, I didn’t know. Interesting. I have never heard of this; I’ll have to check out my dogs’ noses when I get home to see if their colors change 🙂 Very cool factoid. 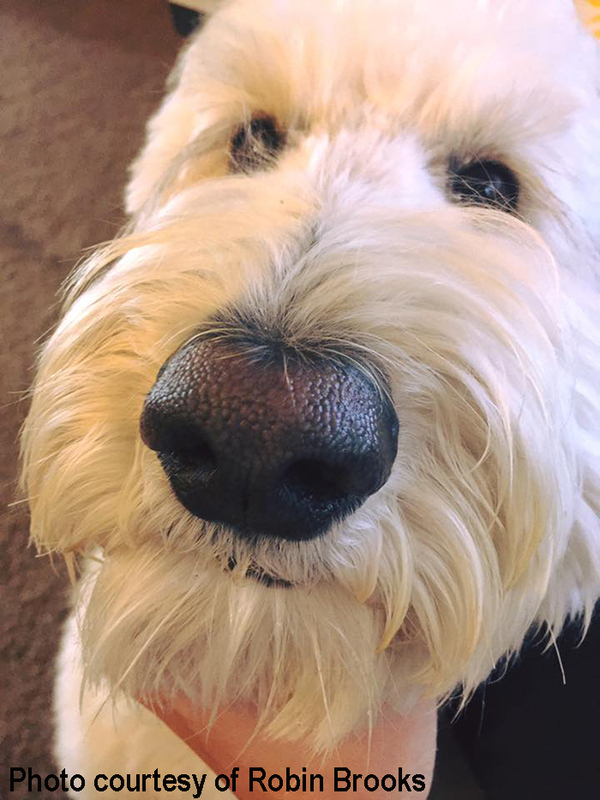 Hello, we have a Goldendoodle and I just noticed this week that his nose changed slightly pink. Jarvis is 2 years old. I have a few questions that hopefully you can help answer since you have gone through this before. To be safe, we have already scheduled appt for him. Can it change this early in the season? He has been acting normal and I haven’t noticed nothing out of the ordinary. Will he be acting a certain way if it was due to something more serious? I hope you don’t mind me asking due to I am new to this and we love our Jarvis dearly and want to make sure he is healthy. I’m happy to hear that you’ve made an appointment with your vet. I always encourage Doodle parents to go to their vet whenever they are unsure of something. I believe (from what you’ve described) that there is nothing wrong with Jarvis. Sounds like his nose is just changing color. With the two distinct breeds selectively cross bred, each is unique to include the pigmentation of the nose. Please let me know what the vet said. I am curious – but not worried. Thanks for stopping by, please come back again soon. I’d love to see a photo of handsome Jarvis too!